Wash those green, soft leaves (20-25 nos. ).Radish leaves are little raw in texture. wash them thoroughly 3-4 times and cut into the small pieces. In a cooker take the small quantity of gram lentil, fine cut radish leaves add the half cup of water and little salt .Close the cooker lid and switch on the gas. wait till 2-3 whistle to come. Switch off the gas and let the cooker’s pressure come down. Heat the small quantity of oil in a pan.Once the oil is the heated season with lots of chopped garlic, red chilies, chopped tomato and transfers the mixture which is in the cooker.Mix them well and add salt as per your taste.Cover it for some time and cook until all the water from the mixture gets evaporated. Once leaves are dry you can serve with steamed rice and daal. 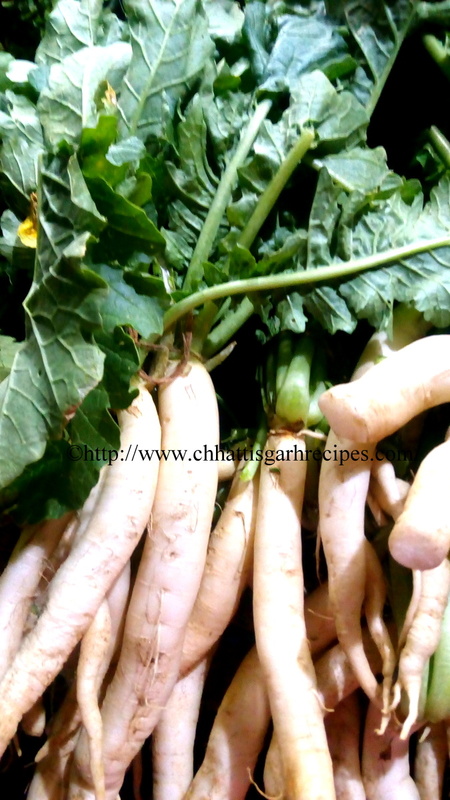 Note; Radish leaves are high in minerals and good for digestion. Traditional Chhattisgarh foods are close to nature and give balance diet.